Bluetooth® speakers provide wireless access to audio content stored on smartphones, computers and tablets that have Bluetooth capabilities. It's easy to see how this kind of device can come in handy, but not so simple to select a specific unit since there are so many products on the market. As editor of LoveToKnow's Technology channels, I had an opportunity to review several Bluetooth speakers and am excited to share information about some of the best available options. If you are looking for a high quality wireless speaker for your home, the Jongo S3 from Pure is an outstanding choice. With its 5" x 5" cube shape, this unit is larger than most portable wireless speakers, but it's a good size for home use. You can use a single speaker to enjoy music in any room, or pair it with additional Jongo speakers to broadcast music throughout multiple areas. I am very impressed with the sound quality and find it to be richer than the smaller wireless speakers designed to be used on the go. TechRadar agrees, saying "When it comes to sound quality the Pure Jongo S3 is about as good as you'd expect from a small unit like this." Each unit has five built-in speakers, delivering sound from all four sides of the unit as well as the top. Slashgear reports that the Jongo S3 model has better sound quality than Pure's Jongo T2 model. The volume control buttons are on the front of the speaker. The battery has a long life, providing ten hours of usage on each charge. A plug-in power cord is included for easy charging. Pocket-lint points out that the battery can be replaced if it stops holding a charge, a feature not common to this type of product. Customers can use the the no-cost Pure Connect app to operate the device and access music apps (such as Spotify or Pandora), audio programming and streaming content. The unit supports Wi-Fi in addition to Bluetooth, though the PureConnect app is required to utilize Wi-Fi. 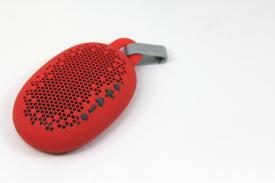 The speaker is available in multiple stylish colors, including yellow, black, green, red and more. PCMag points out that the "bass tends to distort at higher volumes," and the "Wi-Fi app is very limited." Wired reports that the Wi-Fi set-up for multiple speakers is a bit complicated. The speaker retails for around $200 and is available from Amazon. 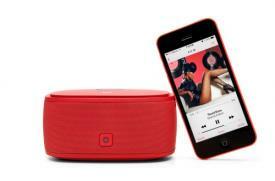 The TouchTone portable wireless speaker from idAmerica is designed to connect to any Bluetooth-enabled device. The sound quality is strong, though not as impressive as the Jongo S3. PCMag states that the speaker "does a good job of conveying bass presence for its size and price." On iLounge, the speaker is described as "the best $80 Bluetooth speaker we've tested." The device is attractive enough to place in visible areas at home or in a professional office and is small enough (approximately 5" X 2 1/2") to be easily portable. Commands (play, pause, forward, back, volume, on/off and mode) are issued via a touch-sensitive interface on the top of the device. A suede carrying pouch is included with the speaker, a great item to have if you plan to use it on the go. It has a built-in microphone, making it an effective tool for hands-free conversations and conference calls via mobile phone. The speaker is available in a variety of colors, including black, bright shades and muted tones. The battery has a four-hour playing life when fully charged. A MicroUSB cable is included with the speaker. An auxiliary cable is included, so that you can use the speaker with any device that has an audio line-out. GadgetMac notes a few limitations, noting that the device's sound "isn't well balanced" and is "heavy on treble" - but that overall the clarity and quality is good for such a compact speaker. This speaker does not come with its own wall charger. TouchTone retails for around $80 and is available directly from Amazon. 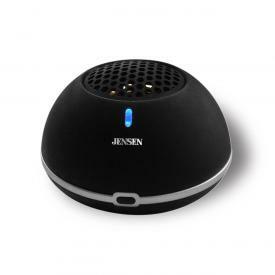 If you're looking for a cheaper portable speaker that would look just as appropriate in the workplace as at home, the Jensen Compact Bluetooth Conference/Music Speaker is a good option to consider. It works well and the sound quality is good in spite of the low price point. Done in basic black and less than 2" X 3" in size, this device is a very compact option. I like to use the speaker when traveling. It's easy to transport, even in carry-on luggage - and with such a low price point (less than $35), I can easily replace it if needed. Like the TouchTone, this unit includes a mic for speakerphone usage. The device features one button for all functions (which are simply on, off and answer phone call). The microphone is located just below the multi-function button on the top of the device. The speaker is on the top of the device. Company literature does not reveal battery life; I used it for two consecutive hours with no problem and a consumer reviewer describes the battery life as "excellent." A USB charging cable is included with the device, but it is not a standard MicroUSB size. This speaker does not have its own volume control function; you will have to adjust the volume on your mobile device itself for higher or lower sound levels. This is strictly a Bluetooth device. It does not have Wi-Fi or line-out capabilities. Jensen is a relative newcomer to the wireless speaker market, though the company has been a leader in the consumer audio market for more than 75 years. This speaker can be purchased for about $35 from Wayfair. If you're looking for a small but stylish wireless speaker, PortaParty from Ch!cBuds is great option to consider. 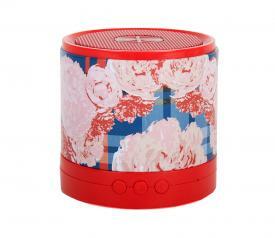 Available in several decorative patterns, this speaker is designed to appeal to fashionistas who want to extend their sense of style beyond the wardrobe to also encompass portable electronic devices. The speaker is shaped like a cylinder and is roughly 2" X 2", making it small enough to fit in the palm of your hand. The sound quality is very good, although, as is the case with most small speakers, sound quality diminishes at a high volume. The device has three control buttons - one that turns the device on or off and answers calls, and two for volume (+ and -). This speaker's battery has ten hours of playing time when fully charged. The speaker area is located on the top of the device. An auxiliary audio cable is included, making it possible to use the speaker with any device that has an audio line-out. Several fashion-oriented patterned designs are available. You can get additional accessories in coordinating patterns (ear buds, head phones, iPhone cases, etc.). The design patterns are not likely to appeal to guys. 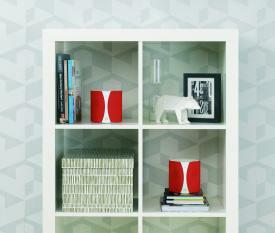 Tweens, teens and fashion-oriented grown-ups are likely to find the patterns appealing. GadgetsandGizmos reports that crispness of bass notes diminishes at a high volume. If you enjoy outdoor activities and want a heavy-duty wireless speaker than can keep up with you, Boom's Urchin model may be the best choice. I have had one of these speakers for several months, during which time I have taken it camping, hiking and boating. I have dropped it several times and it has gotten wet, and is none the worse for wear. It is about 7" X 1", providing for a solid base when the device is on a flat surface. The sound quality is good. Gadling reports, "The high end of the audio spectrum comes through bright and clear, while the mid-ranges are delivered vibrantly too. The Urchin sounds great even when the volume is completely cranked up with no discernible distortion." The speaker is designed to be water resistant. It is also designed to be shockproof and dust-proof via a silicone skin covering the speaker. The battery can play for eight hours when fully charged. The device has speakerphone capabilities, but this is not its strong point according to both an iLounge review and Gadling. A wall charger is included with the speaker, along with a standard MicroUSB charging cable. An auxiliary audio cable is also included, so the speaker will work with any device that has an audio line-out. It also comes with a carabiner clip (which I have used to attach the speaker to a backpack) and a suction cup (which you could use to mount it to a boat windshield or a window). It is available in black or red. You can purchase silicone skins in a variety of colors for around $20 each if you prefer a different shade or want to change up the color. You can also purchase a clamp to mount the speaker to a bicycle for around $20. TechnologyTell reports that the device's "bass is slightly weak, but present" - likely a side effect of the silicone skin and rugged construction. Order directly from Boom for around $100. Silicone skins and bicycle clamps are also available here. There are many options and price points for wireless Bluetooth speakers. Whether you plan to use yours with a tablet, computer or smartphone or if you plan to use it at home, at work or on the road, there is sure to be a product that meets your needs perfectly.